This is a great commercial that the fellas at NHL put together to promote the Stanley Cup Finals. ...only one problem...where are the 1989 Stanley Cup Champions??? Look familiar? Click here to see where it originally came from. Yeah, I totally got jacked. Oh well, I have been borrowing photos for this blog since day one. I guess that means someone other than walkinvisable is reading this blog of mine. I listen to Fan 960 all day while at work (except for Jim 'Douchbag" Rome). This morning, Mike Richards interviewed Calgary Flame great, Theoren Fleury. It was a basic interview, it is available on podcast, I will try to post it if I can figure out how. Theo talked about hockey (Flames, junior, Belfast) and his new business as owner of Fleury's Concrete. Growing up in northern California, hockey was not an 'accepted' sport. Theo was the reason I got into hockey. Thank you for that. The first game I ever went to (Sharks at the Cow Palace in San Francisco), I made a drawing for Theo to sign. A security personnel brought it to him, since I was not allowed into the locker room. He signed it, but keep the pen. They said my name a few times, and read the entire email. Of course they could not resist the easy 'Manson' jokes. Here I am sitting in my cube in El Segundo, California and I hear my name and my words being read in Calgary. That is awesome. Mike commented on retiring Fleury's number 14, before getting into my email. I am sure that I am not the only person that thinks that Theo should get his number retired. Fact: 1.He is THE BEST player ever to play with the Flames (Iginla is a close second). 2. 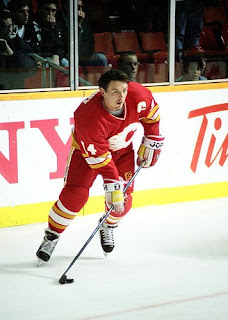 No other play has worn #14 for the Flames since he was traded in 1999. 3. Still holds franchise record for most points as a Calgary Flames player - Iginla passed him this past season in games played, and goals. Also, I wrote Theo a letter when he was still playing in Calgary and addressed it to the Saddledome. Enclosed was his rookie card, I basically asked him to sign it for me. A few months later, I got it back signed. I still have it and the drawing i got signed. I still have a Theoren Fleury poster in my room at my parents' house. Yeah, I am a total geek, but this man really did have an impact on my life. Thanks Theo. First off, it is the Campbell Conference, not Western Conference...and Wales Conference, not Eastern Conference. Also, it took me years to figure out the division separations (Pacific, Northwest, Central, Northeast, Southeast, Atlantic) being used to the old, and better, Smythe, Norris, Adams, Patrick. Why does the NHL need to regionalize the division names? Is it so it is more marketable for the US market? Half the people in the US cannot even find the US on the map...you think they know what north, east, west and south are? Competing for the Prince of Wales Trophy...or for you idiots out there, the Eastern Conference. (2) Pittsburgh vs. (6) Philadelphia - This one is obvious, the winner of the Pennsylvania State Championships will be....Pittsburgh. Why? Simply, they are the better team...but really, everything is about marketing and the NHL is no exception. 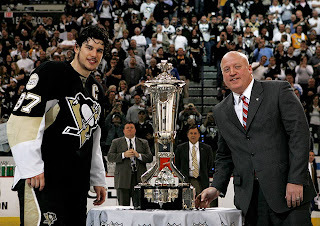 With Sidney Crosby the poster boy of the NHL, the Next One, the Phenom, Sid the Kid....there is a lot of money invested in the success of number 87. For the record, I like the guy, I think he is a great choice for the NHL to have as a spokesperson. I also think Jarome Iginla would be a better choice, because he is simply the best player in the NHL (regardless of stats and achievements..because I said so), but Sidney is a good second choice. How many games you ask? I say six. Since this is just a state championship, travel time and home ice will not matter too much. Penguins went four games against Ottawa, five against New York...this time it should be six. Flyers went seven against Washington, five against Montreal...again time for a six game series. Also, look for the P of Orange, yeah, I thought of that on my own. For the Clarence S. Campbell Bowl or Western Conference, whatever. (1) Detroit vs. (5) Dallas - So we got P vs. P in the east, and D vs. D on the west. This on is way more obvious that the other conference...it is going to be Detroit...but I am the crazy one, so i am going with Dallas. Why? The Stars beat the defending champs, not like that really makes any difference here. But, what really matters is they beat San Jose and that alone should give you a pass into the next round. I wish the Sharks could have lost at home, but due to some crappy officiating and goal judging...NHL conspiracy...two goals by Brenden Morrow were disallowed and Dallas lost in OT. Notice I did not say 'Sharks won'. Justice was served as Dallas won at home last night in the fourth overtime. I wish I could have seen the Sharks faces as Brenden Morrow scored that power play goal. Awesome! What, how many? Eh, I am going with six on this one, too. Dallas won both their series in six games, 666 will take them to the Holy Grail. Off the record, the Red Wings will take it in five. But, do we really need Detroit to win another cup? No, so Dallas it is. Remember, I could be right in these predictions...but I am usually wrong. In addition to the Hart, Jarome Iginla was nominated for the Lester B. Pearson Award. Just like the Hart, Iginla's fellow nominees are Malkin and Ovechkin. Both the Pearson and Hart are MVP awards. Only difference is, the Hart is voted by the writers, while the Pearson is voted by the players. Surely the writers will vote for Ovechkin, but the players know (like everyone knows) that Iginla is a monster and he should win. The Flames captain won the Pearson in 2002. 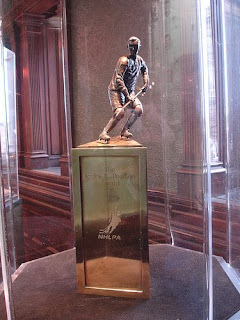 That year he also won the Art Ross Trophy (leading points scorer) and the Maurice Richard Trophy (leading goal scorer). He was also the a finalist for the Hart that year, coming in second. Why did he not win the MVP that year you ask? Well, aside from not making the playoffs...one writer did not include Iginla's name on the voting ballot, he needed that one entry to win. That writer was from Montreal...and who won that year??? Jose Theodore of the MONTREAL Canadiens. Damn you, unnamed Montreal writer.